What those in dying business sectors call failure, we in tech know to be pre-greatness – Gavin Belson, CEO of Hooli. These may just be the words of a fictional character from Silicon Valley, but they struck a pretty resonant chord with me this month. I’m Alex, and I’m in the final year of my PhD. Recently, I had something of a mental crisis and was considering quitting my program. I know I’m most certainly not alone in struggling with academia, and the topics of failure and stress handling have been well addressed on the Errant Science blog before, but I thought I’d add a few of my more recent experiences to the mixing pot. The biggest contributor to my recent brainmelt by far has been the constant rollercoaster of optimistically waiting for developments with almost guaranteed disappointment. This has taken the form of collaborators quitting or abandoning projects without informing me, manufacturers repeatedly sending faulty equipment and my own institution for throwing up roadblocks that have taken months to mitigate. Don’t get me wrong, I’m responsible for my own failures in the lab too and I often procrastinate like a champ – but when you’re waiting on other people and days turn to weeks turn to months without progress, it definitely takes its toll. By January this year, I had just lost confidence that anything I suggested or attempted to organise would actually happen because it relied on the involvement of other humans. I remember that on the first day of my PhD, I was called into my supervisor’s office and immediately told that a vital piece of equipment wasn’t ready. Call me naive, but I saw this is as an early stumble – not a staple of my working week. What The F**k Does This Have To Do With Viennese Whirls? A few months ago, at the end of a particularly sour week, I told my labmates I would handle the weekly bake offering. This should literally have been a piece of cake. I decided to make Viennese whirls, and for a while, it was good. Once I had made the biscuits, it was time to make the buttercream. What could possibly go wrong? Then, I saw it. The unopened packet of icing sugar. Or icing-berg if we fancy going with a Titanic metaphor. I was so sure that I had used icing sugar earlier to make the biscuits, but apparently this unopened packet was telling me otherwise. That was it, the sanity ship was going down. I screamed a little bit, then started kicking the fridge and swearing at it. How on earth had I forgotten the icing sugar?! If I was worried about my abilities as a scientist earlier in the week, now I was questioning my abilities as a human being. Because of icing sugar / lack thereof. I was in a whirl of Viennese madness. A delicious blend of buttery rage and creamy relief (gross). While part of me was happy that I hadn’t in fact “F***KED IT ALL UP”, another part of me realised that all it had taken to push me over the edge was a box of biscuits – at that point, I knew that I needed to do something about it. This was the incident that finally spurred me to talk about my struggles, and I’ll never forget it. At its heart, science is the art of exploration and experimentation, and these things don’t guarantee success 100% of the time. There will always be failures, but most of the time these failures aren’t the end – they’re just stepping stones towards real progress. It’s taken me a while to fully get on board with actually understanding this, and the following list is a compilation of things I’m currently doing to helping me deal with the stresses of failure and research inertia. Speak Up! – As I mentioned above, I only started dealing with my problem once I actually started talking to other people about it. Now, as soon as I feel myself struggling to carry on, I make a point to talk it through with someone. Even if they may not be in academia, everyone feels stress and just talking it through with someone can work wonders. Celebrate Every Achievement – I recently presented the work I’ve done on my PhD so far at a regional symposium. I was so nervous because I believed I had so little to show compared to the other presenters. To my amazement, I was awarded with the prize for the best talk (#humblebrag) and this boosted my self-esteem enormously. If I can convince someone else that my work is worth sticking at, then I can definitely convince myself! Believe in Shakira – As ridiculous as it may sound, listening to Shakira’s Try Everything from the Zootopia soundtrack on repeat has been helping to remind me that even if it feels like I’m making minimal progress, just the effort of trying is worthy of merit. Of course, this doesn’t mean I should keep blindly hammering away at a problem that I don’t know how to solve. Taking a break from a problem is often the best way to analyse it fully, but sometimes it can just a case of putting the time in. 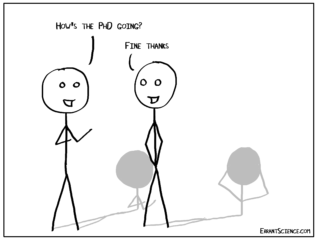 Understand That I’m Not Alone – Recently I saw someone state their disapproval for the “PhD Comics” series for their cynical take on academia. 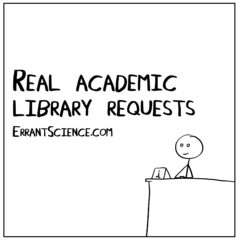 It seems that some people might find their parodies perpetuate a negative view of academic research. For me, I find them as a constant source of reassurance that I’m not alone in facing these bad experiences – these type of comics and discussions remind me that I’m not the only one finding academia a tough nut to crack. 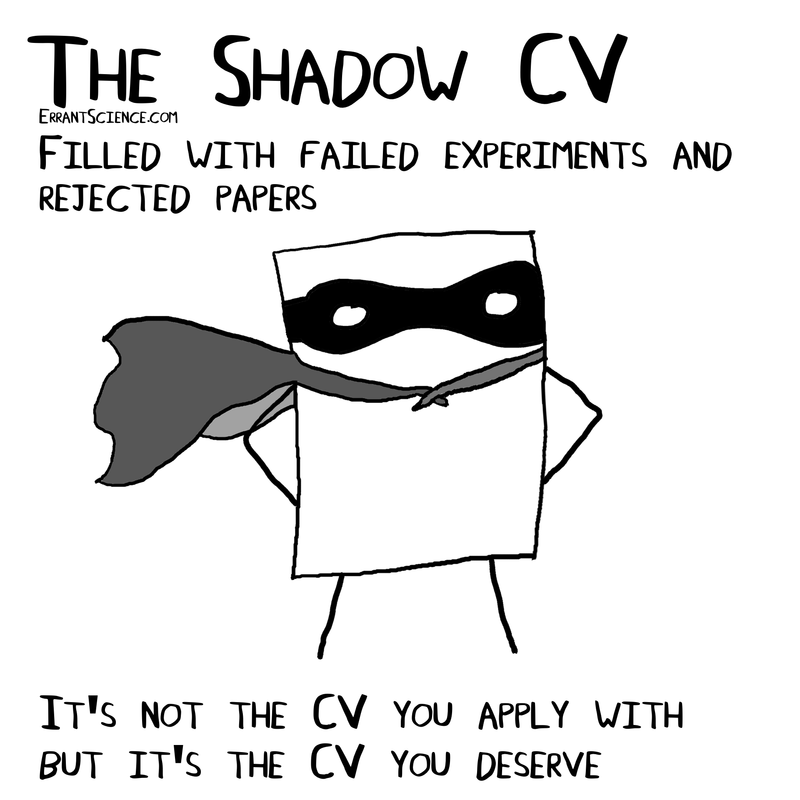 The Shadow CV – I was recently introduced to the idea of a ‘Shadow CV’. A place where you can list the projects you started but never finished, the grants you applied for but never received, the papers you submitted but never published. It’s a way of showing how much effort you’ve put into all of your academic endeavours, not just the ones that look good on paper. 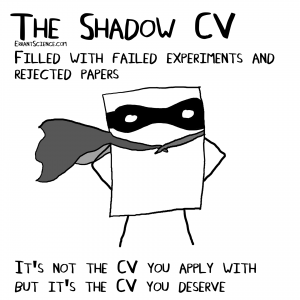 I love the concept of a Shadow CV, so I’ll hopefully be expanding on them in a future post. If you would like to experience failure at making your own Viennese whirls, here is the recipe! Don’t forget to add an overdramatic scream of anguish and a few kitchen appliance kicks for good measure.